(BOSTON) — A consortium of 48 scientists from 50 institutions in the United States — including Pamela Silver, Ph.D., a Core Faculty member at the Wyss Institute for Biologically Inspired Engineering at Harvard University — are calling for a Unified Microbiome Initiative that would span national cross-institutional and cross-governmental agency support. 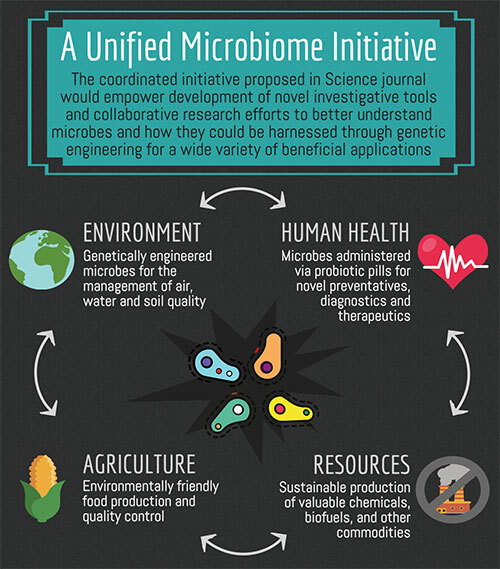 The group, called the Unified Microbiome Initiative Consortium (UMIC), envisions that a coordinated effort would drive forward cutting edge microbiome research, enabling breakthrough advances across medicine, ecosystem management, sustainable energy and production of commodities. Their proposal was published online in the journal Science on October 28. “Microbes are everywhere. Therefore understanding microbiomes, whether they be the ones that live in and on our bodies or the ones in the environment, is essential to understanding life,” said Silver, who in addition to being one of the faculty leaders on the Wyss Institute’s Synthetic Biology platform, is also the Elliot T. and Onie H. Adams Professor of Biochemistry and Systems Biology at Harvard Medical School (HMS) and a founding member of the Department of Systems Biology at HMS. The UMIC consists of leading microbiologists, ecologists, physical scientists, engineers, and scientists in the emerging field of synthetic biology. The group coalesced during a series of coordinated but separately convened meetings held by The White House Office of Science and Technology Policy and The Kavli Foundation. The proposal in Science got its roots from the UMIC’s efforts to identify challenges and opportunities in microbiome research as well as their strategic recommendations for accelerating discovery that emerged from these meetings. “Understanding how [microbiomes] work might hold the key to advances as diverse as fighting antibiotic resistance and autoimmune diseases, reclaiming ravaged farmland, reducing fertilizer and pesticide use, and converting sunlight into useful chemicals,” said Jeff F. Miller, Ph.D., Director of the California NanoSystems Institute and corresponding author of the Science paper. By metabolic processes, microbes synthesize countless different molecules, which through genetic engineering could lead to colonies of microbial “workers” being used for the sustainable synthesis of pharmaceuticals, materials and chemical commodities. Genetically engineered microbes could also produce biofuels through metabolic processes and conversion of solar energy into liquid fuel, according to work already underway by Silver at the Wyss Institute and HMS. Microbes also play a vital role in balancing biogeochemical processes, such as removing carbon dioxide from the atmosphere. The interactions between soil, plant roots and microbes play an important role in plant health and crop yield. Furthermore, the microbiomes in our gastrointestinal tracts regulate wide-ranging physiological, metabolic, immunologic, cognitive, behavioral, and psychiatric traits. Understanding and manipulating human microbiomes could be key to managing physical and mental health. Silver and her team have already begun developing several potential avenues for leveraging gut microbes to improve health. In collaboration with Wyss Core Faculty member James Collins, Ph.D., Silver has engineered genetically programmed bacterial “reporters” that can detect and record conditions in the gastrointestinal tract. And, working with Wyss Institute Founding Director Donald Ingber, M.D., Ph.D., and Wyss Institute Senior Staff Scientist Jeffrey Way, Ph.D., Silver is developing consortia of synthetic microbes that could be used to treat gastrointestinal illness. Her expertise and experience in these emerging areas of synthetic biology has enabled Silver to contribute her thought leadership as a member of the UMIC to how the proposed Unified Microbiome Initiative could integrate focus areas to accelerate microbiome research. Some of the big questions the group hopes to address through an organized coalition include understanding how microbes assemble into communities and what makes them resilient or resistant to perturbation, how genes in the microbiome interact with one another, which genes in the microbiome are associated with which organisms, as well as how we can beneficially harness the microbiomes of humans, animals, plants and environments. To find the answers to these questions, scientists must first be supported in the development of breakthrough technologies for investigating microbiomes. Specifically, the group recommends development of improved computational methods for analyzing and predicting the vast number of unknown genes and their functions comprising microbiomes; a transition from gene-specific to whole-genome based analysis through improved genome reference libraries and sequencing methods; developing high-powered imaging methods for visually interrogating communities of microbes down to the individual level; new adaptive modeling systems and data reporting tools; improved genetic engineering techniques for perturbing microbial communities; and novel methods to mimic natural environments for supporting microbiome growth in the laboratory, among others. The paper calling for a Unified Microbiome Initiative can be found in the October 30 issue of Science or through an online portal made available by the American Society for Microbiology.